Bike and Trains Study Tour, Netherlands from Quickrelease.tv on Vimeo. Carlton Reid at Quickrelease.tv featured this video of some highlights of a visit to the Netherlands by Members of Parliament and Lords of the All Party Parliamentary Cycling Group. Studying up on bikes and trains. Here's hoping they can influence change in the UK. Via a reader Christopher, who got it via Cyclelicio.us who got it via Quickrelease.tv. 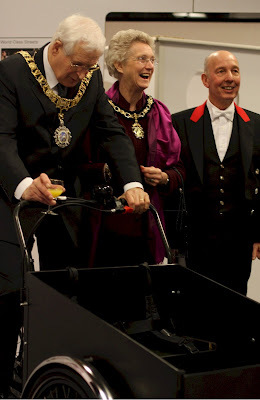 In other related "British men with fancy titles" news, here's the Lord Provost of Edinburgh, George Grubb, with a gift from Denmark - The Danish Dream on Wheels - a Christiania Bike. It was presented to him at the Dreams on Wheels Exhibition in Edinburgh a couple of months ago. At the conference in Edinburgh, his official car was outside with the motor running while the Lord Provost was inside talking environmental messages. "The bicycle is C02 neutral and I'll do my best to promote Edinburgh as a sustainable city", he promised. Despite the 'mayor gear', George worked as a bicycle delivery boy when young. Back on yer bike, George.